This magnetic force between current-carrying wires calculator lets you find the magnetic force between two parallel, long and straight wires carrying the current. Read the text below to learn why do wires repel or attract each other at all and how can you estimate the strength of electromagnetic force between them. Electric current flowing in the wire can be described as an ordered movement of tiny charged particles - electrons. We know from Maxwell's equation that every moving charged particle produces a magnetic field. With our magnetic field of straight current-carrying wire calculator you can check how strong magnetic field can be created. On the other hand, every moving charged particle in the magnetic field is subjected to the Lorentz force. Therefore, the magnetic field acts on the wire with current flowing through it too! 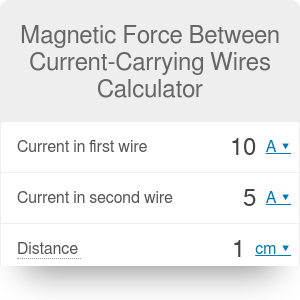 Check out out electromagnetic force on current-carrying wire calculator to estimate the force acting on that wire. If one wire produces a magnetic field, the other one feels it as the electromagnetic force. That's why two current-carrying cables interact with each other. μ0 is the permeability of free space which have constant value μ0 = 4 * π * 10^(-7) [T * m / A]. In many cases, we want to determine the force acting only on the selected wire section. For that reason in above equation, we have used the term F / L. It means that if we have a wire with a length of L, it will be subjected to the force F.
So far we have only said that two parallel current - carrying wires can interact with each other. But can we predict whether they will repel or attract each other? Yes, we can do it using our calculator! Current can flow through the wire in two directions. Let's indicate one with positive value I > 0 and the second with negative I < 0. If two wires are carrying current in the same direction they attract each other (because F / L < 0) and they repel if the currents are opposite in direction (because F / L > 0). Moreover, due to Newton's third law, the force acting on first wire must have the same magnitude as the force acting on the second wire. Magnetic Force Between Current-Carrying Wires Calculator can be embedded on your website to enrich the content you wrote and make it easier for your visitors to understand your message.